Hercules ( lat. Heracles ) was the most famous hero in Greece, son of Zeus and Alkmene. When Herclues rendered service for Eurystheus, the king of Mykene, he had to master twelve dangerous tasks. As remuneration he was promised to receive immortality. 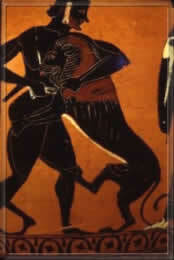 The first task was to exempt the Valley of Nemea from a terrifying lion. a lion with a skin hard like steel but nevertheless supple. Its dreadful claws sharp and hard like diamonds. This lion was not easy to stalk and to kill because it lived in a cave with two escape routes. Heracles arrows could not harm it and all of his other weapons didn't work either. In order to keep the lion from escaping, he blocked the caves' second exit, went into it straight from the front and strangled the lion with his bare hands. Not even in the dead lion body he was able to cut with his knife so he had to use the beasts diamondhard claws to cut off the skin. 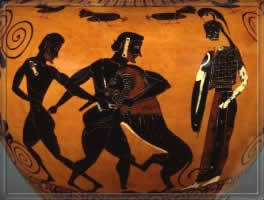 Heracles wrapped the skin around his shoulders and was wearing it like an armor. ---> forward to " Androcles and the lion "